Biography is one tool for studying our shared past. The lives of the earliest members of the Indiana Supreme Court provide an intriguing opportunity to glimpse both the social and legal history of our state in its earliest years. 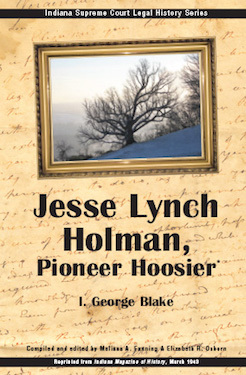 This offering from the Indiana Supreme Court’s Legal History Series documents the legacy of Judge Jesse Lynch Holman, one of the original three members of Indiana’s highest court. Holman initially served the people of Indiana as a federally appointed judge of the Indiana Territory. When we became a state, Governor Jennings appointed Holman to the Indiana Supreme Court alongside John Johnson and James Scott. He later served as Indiana’s federal district judge. Holman came to Indiana from neighboring Kentucky and was one of the founders of the southeastern Indiana town of Aurora. As a judge he helped to forge the legal foundations of our state, serving in Indiana’s courts from 1814 to 1842. Holman’s interests were not limited to the law. He was instrumental in the founding of several Indiana colleges, an opponent of slavery, and the long-time pastor of the First Baptist Church in his hometown of Aurora. Despite his service on the territorial, state, and federal bench for twenty-eight years, only a few Hoosier lawyers or historians know much about Judge Holman. This volume helps share the riches of Holman’s life and judicial career by reprinting an article written by Professor I. George Blake in 1943. Blake used the widest variety of sources available at that time, including manuscripts, county and state histories, and political histories. Thanks to many digitization projects, and the renewed interest in family history, we have been able to enhance Blake’s work by adding pictures and other images to the original article. I am delighted to offer you this glimpse into the life of an important Hoosier and the opportunity to learn more about Indiana’s fascinating legal history. One of the goals of the Indiana Supreme Court Legal History Series is to increase Hoosiers’ knowledge and interest in their past. Additional copies of this publication and other educational materials produced by the Indiana Supreme Court are available at no charge.